After spending 30 years in the steel fabrication and distribution industry, Roger Palmer found many needs & services were not addressed by most steel distributors. Roger launched MetalMart in 1993 and has prospered for over 26 years. 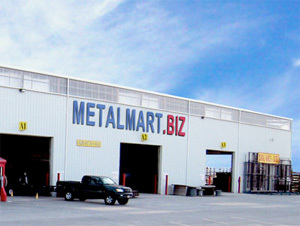 MetalMart is a retail center in Lehi that supplies all types of steel & aluminum products. The company supplies materials for every type of customer, from the “do-it-yourselfer” to the contractor/fabricator. Metalmart specializes in many steel, aluminum and stainless items that are perfect for your next steel project. From Metal roofing for your homes, cabins, barns and sheds, to steel tube & pipe, plate, steel shapes, corral panels and more. MetalMart services all types of customers from large companies to small “mom and pop” operations. Metalmart prides itself in having quality products from the leading mills and manufacturers at competitive prices everyday. Metalmart also stocks some “secondary” products to save you even more money on your steel project needs. In 2007, Roger decided to move the company to a larger facility in Lehi, and MetalMart has been able to grow by servicing more customers at the same time with greater efficiency, thus resulting in improved service. With more inside storage and a larger product line, MetalMart continues to grow in all areas of the business. The new facility also boasts a beautiful showroom stocked full of popular items for the Handyman or Fabricator, including: ornamental iron supplies, steel hinges, welding supplies and much more. MetalMart continues to expand into regions beyond Utah including Idaho, Wyoming, Nevada, Colorado and Arizona. Happy return customers have been the company’s biggest growth factor, combined with excellent service and competitive prices. Apart from other companies that provide similar products and services, MetalMart welcomes all orders, large and small, and focuses on fulfilling customers’ needs. MetalMart stands out for its attention to the customer.